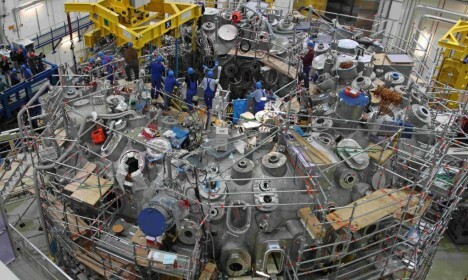 Nearly 20 years and 1,000,000,000 Euros in the making, this fusion reactor in Germany, a potential harbinger of a huge shift in how we generate power around the planet. It is set to be turned on this month. The Wendelstein 7-X stellarton fusion reactor creates energy by using massive coiled superconductors to generate magnetic fields. Contained hydrogen gas is then heated to until the atoms fuse. The 50-foot ring features 250 access ports and houses 50 six-ton coils. The stellarators are harder to construct than their competing tokamaks but are much more robust and can be used continuously rather than just in short bursts. If this one works well, it will likely be the first of many. See more in Energy & Power or under Science. November, 2015.